Crystal Boninhttps://readreadwrite.wordpress.comI am a public high school teacher in New Hampshire. 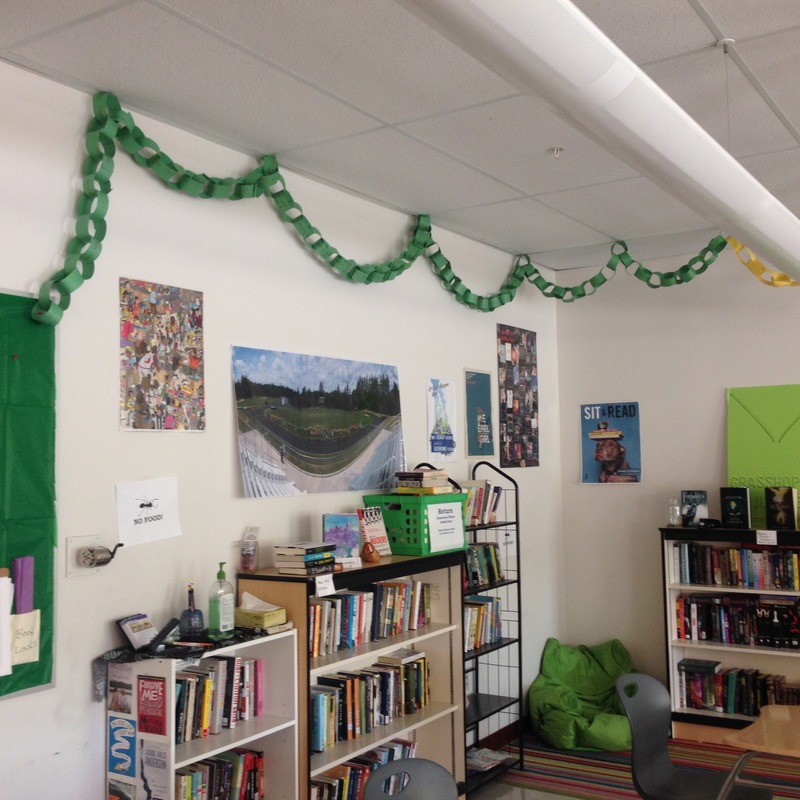 Each link of that green paper chain represents a book read during May. We read 91 books last month! That’s 726 so far this year! Providing choice doesn’t decrease rigor. Today, I asked one of my Honors students what she thought of that. I mean, there are kittens and rainbows around my classroom (really), but she’s right. Most of the time, we choose our content and we choose our topics, but we work very, very hard in here. We produce multiple drafts through our whole-class workshop, and sometimes, students will revise five times until they’re happy with their final product. In these final weeks of school, my students have (almost) complete freedom when it comes to the final pieces they’ll bring to workshop. They have to choose one of the genres we’ve practiced and decide which rubric works, but they can write about whatever they want. I was nervous about giving them this freedom, since the last time I left them to their own brains, they floundered for awhile before finally producing a draft. This time, they’re loving it. While some students are writing narratives and reflective essays, most…are writing research papers. One student in my fourth period class is writing an analysis on different types of cats, while another is writing an inform/explain piece about the Space Race. A handful of students are writing new essays with recycled prompts. Some are writing another lyric analysis, and others are revisiting the “I was a witness” prompt from earlier this year. One student is using this assignment to workshop a “personal statement” that he’ll have to read in traffic court in a few weeks. A few others are writing lengthy reviews of their favorite books to post on GoodReads. We’re having fun with our writing again. These last few weeks have been my favorite days of the year. As much as I’m looking forward to summer adventures, I wish we had more time to write seventeen more pieces like this one. We read 74 choice books last month! Spring fever has hit. Prom is two weeks away. It’s getting warmer. The end of the year is in sight. Everything is distracting. We’re still reading. That’s 635 books read so far this year! I’ve left school every day this past week with a pit in my stomach and tears in my eyes. It’s incredibly important for my students to learn, but it’s also incredibly difficult for me to teach. What happened during the Holocaust is horrific on its own, but as someone with Eastern European and Jewish roots, it’s especially hard for me to stomach. I’m running a genre study around this work, but it looks a little different in my Honors class than it does in my CP classes. But that’s what the workshop model is all about: Our end goal is the same, but all students are able to take the path that works best for them. To start, we watched one of John Green’s Crash Course clips and took quick notes on what was going on during WWII aside from the Holocaust. Thanks to The History Channel, many of my students already have a bit of background knowledge on Hilter’s actions during WWII. Because of this, I didn’t want to waste anyone’s time with long, drawn-out background documents. Instead, I split a 12-page informational passage into 12 pieces and we ran a jigsaw. Each student read and summarized a section, and then read that section aloud to the class. While they were reading, the rest of us (me too!) took notes that would be reused on the summative later. In my Honors class, we’re running our genre study with novels. My students chose between Elie Wiesel’s Night and Anne Frank’s The Diary of a Young Girl, and while we read and discuss, they’re pulling pithy quotes that they’ll reuse on their summative assessment later. Our discussions are tough, specifically with Night. While Wiesel’s book is beautifully written, it’s also horrifically detailed, and we leave our discussion feeling sick and sad. Originally, I had planned to use these same novels in a genre study in my CP classes too, but since we’ve spent so much (valuable!) time in writing workshop over the last few months, time has gotten away from us. So in my CP classes, we’re sampling a variety of literature. Our amazing librarian Pam Harland compiled some resources for us, and we started with this bank of diaries, letters, and memoirs from Yad Vashem. Because giving my students choice is at the center of everything we do in my classroom, students chose whichever passages they wanted to work with. They read, summarized, pulled quotes, and then shared their findings with the class. Next week, my CP students will choose excerpts from either Night or Diary of a Young Girl to work with, and then, finally, they’ll work with poetry of their choice. My Honors summative assessment is a little different than my CP assessment, but our end goal is the same. At the end of this month, all of my students will conduct research into current cases of genocide in the world. They’ll compile their reading analysis and research together in an answer to our essential question in a summative performance assessment of their choice. This is an incredibly difficult subject for me to teach, but teaching it though a genre study has been extremely valuable for my students. Their ability to choose (and abandon) texts has helped them become emotionally invested in the texts, which is what we want when we teach Holocaust literature…so history doesn’t repeat itself. We made it to shore. I was nervous about letting my students flail around to find their way on our argumentative writing practice. After providing formulas and exemplars all year, I took away the lifeboats of a formula and exemplar for this assignment. Their uncertainty and stress broke my heart a little. Three weeks later, we’ve finished. It took a lot of patience on my part, and a lot of perseverance on theirs. We spent the entire first week thinking and drafting, and then the next week, ran our pieces through workshop. After our first revision, we ran through another workshop that was focused around the rubric. During our assessment workshop, we used crayons to identify the background information, the arguments and counterarguments, and then the proposed solutions. After that, we wrote our (color-coded) feedback for our authors. The freedom from a formula and exemplar encouraged my students to be creative in their (normally boring) argumentative writing work. While most wrote essays and letters, some wrote raps, memoirs, and one student even wrote a one-act play. Another wrote a novella. That kind of creativity wouldn’t have happened with a formula and exemplar. March celebrations and the springtime reading slump. We read 68 books in March! 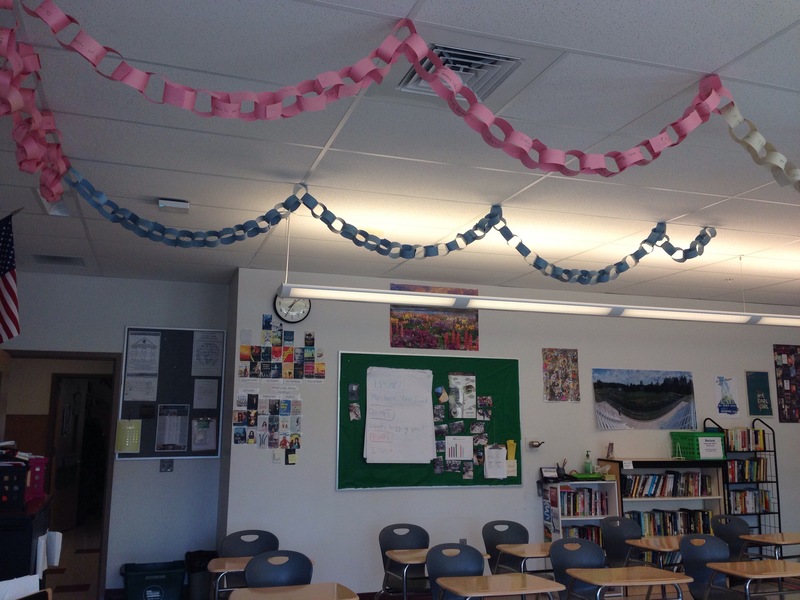 Each link of that light blue paper chain represents a choice book read in March! This is the time of the year that traditionally carries the lowest “read” numbers. It can be discouraging after so much progress. Most have read 5-7 books so far this year, and have exhausted the next lists they keep in their journals. They’re lost on what to read next, and it makes them lazy. So we book pass. I book talk. I pull piles of books for individual students. I buy new classroom library books to keep our shelves interesting. I have to push books harder to at this time of year than I did back in September. It’s hard work. And although it’s one of our lowest totals, we still read 68 choice books last month and have read 561 choice books so far this year. That’s nothing to be disappointed about. It’s something to be proud of. I took away the writing lifeboats. Really great English teachers are really great about providing students with lots of scaffolding, organizers, and exemplars to bring their students to the final written product successfully. As a department, though, we sometimes worry about what this “help” means for our students’ post-high school writing. Will they be able to write without us? We’re working on argumentative writing, our final “assigned” writing assignment before my students choose their own topics and genres for our remaining workshops. Fleshing out both sides of the argument. My students chose their own topic to argue, and we spent the early part of this week fleshing out our arguments and counterarguments. I modeled and walked them through a four-point argument chart. They took down great notes and came up with three possible solutions and their corresponding benefits. They stared blankly at me. For the first time this year, I haven’t shown them a model essay, and I haven’t told them what content they should put where. On this first day of drafting, despite having every bit of content they need for this paper, most just could not get started. While four students immediately grabbed a laptop to start writing, the other nine stared blankly into space or doodled. Some made some notes on their graphic organizers before the end of the period, but not much writing happened today. After today’s classes, I can see that despite our constant work and revision during class, my students still see their writing as a “test” and not as a process. I know they’ll eventually write Something to bring to workshop by next week, even if it’s a Horrible Something. This might be our longest drafting process yet, and it’s confirming my worst fears, but we’re all learning together.